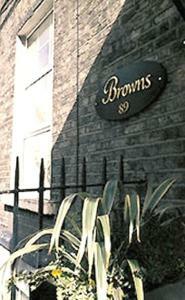 Browns Hotel, Dublin discount hotels and accommodation. Browns Hotel is a three star boutique hotel that was totally renovated in 2001 and offers comfortable accommodation in the heart of Georgian Dublin. It is just two minutes from O'Connell Street the capital's main street and is on the door step of all that Dublin has to offer. View photos, room descriptions and make online reservations at Browns Hotel. Save on room prices at Browns Hotel, Dublin.